The day before leaving for our European cruise, we were having some bubbles at The Mercer Kitchen with a friend who had just moved to New York. My partner and I were explaining our competition quest to visit all 50 states, with one of The Partner’s unvisited states was Alaska. Our friend, knowing we were going to be in Seattle a month later, calmly suggested: “Why don’t you do a day trip to Anchorage from Seattle?” And that is how the idea of a day trip to Alaska started. Having grown up in Seattle, I’m all for being a tourist in my hometown. But we go to Seattle at least twice a year…there’s only so much to do (sorry Seattle, I still love ya!) So the idea of a day trip to Alaska was appealing, and come to think of, it was actually pretty doable. From the Admirals Club at JFK Airport before heading to Europe, we were able to book air tickets to/from Anchorage. 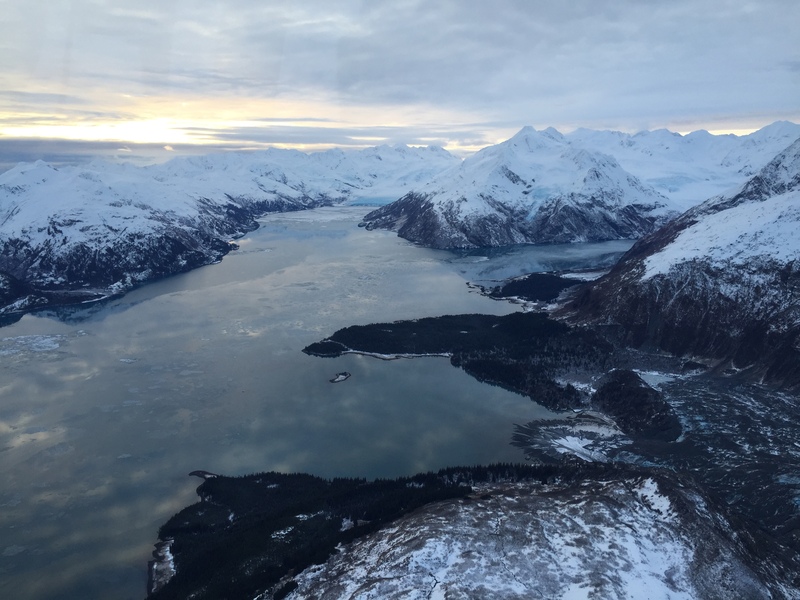 We used American Airlines AAdvantage miles for a first class ticket to Anchorage on Alaska Airlines and Chase Ultimate Rewards for Alaska Airlines tickets back to Seattle. As a result, out-of-pocket expenses were kept to a minimum. Once home from the cruise, I started working on what to do during our seven hours in Anchorage. 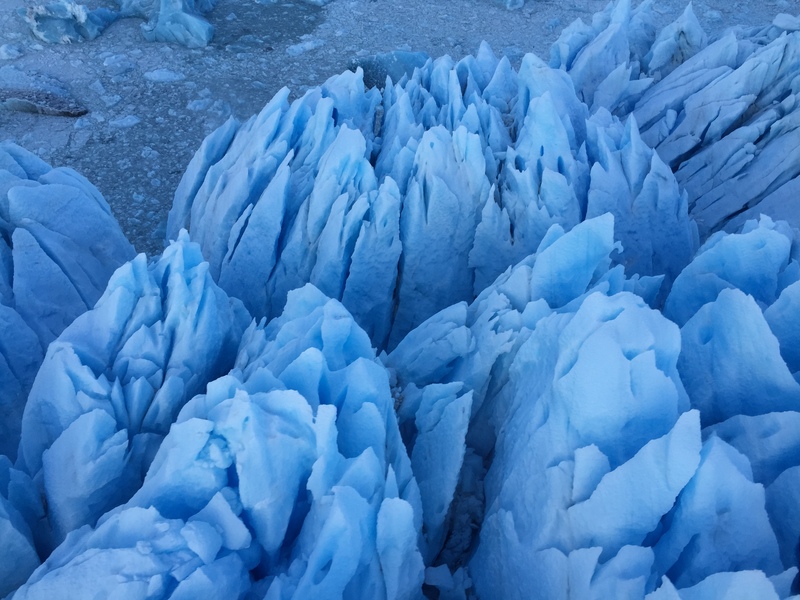 On our list of must-dos included checking out downtown Anchorage and to see glaciers. When I visit new cities (I had been to Anchorage for a few days when I was in college, but didn’t remember much) I turn to Frommer’s. Frommer’s has great summaries for how to see a city in three or less days. Frommer’s, unfortunately, didn’t list much to do in Anchorage, especially in the winter. So, our plan there would be just to drive around and find a decent place for lunch. I was hoping to find some sort of boat tour that would take us out to see the glaciers. But when I started googling “glacier boat tours” I quickly realized there would be a problem. All of the glacier boat operators were closed until March. That wouldn’t work for us. 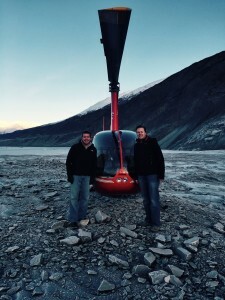 So I began searching some more and realized that something far cooler (albeit, much more expensive) was available: aerial helicopter tour with a glacial landing. 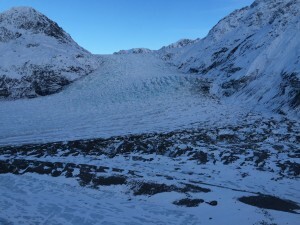 GLACIAL LANDING! After reading on Alpine Air Alaska’s (based out of Girdwood, Alaska) website that they offered helicopter tours in the winter, I contacted them via email for availability. 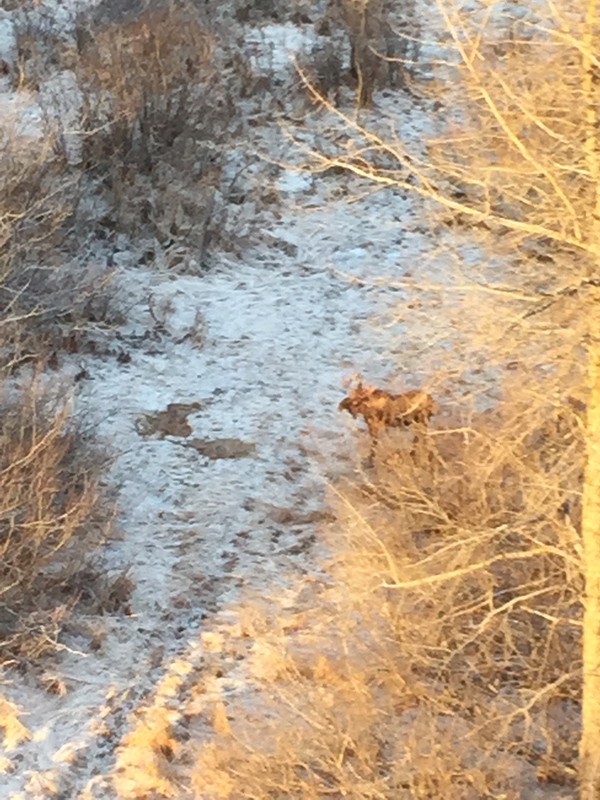 They were quick to respond (same day) and fortunately for us, they had availability on the day we would be in Anchorage. I sent in my credit card and passenger information and we were confirmed. The flight from Seattle to Anchorage was nice. I hadn’t experienced First Class on Alaska Airlines in over a decade. The crew was fantastic – typical Alaska Airlines – friendly, chatty, and fun. The flight was empty – if I recall, there were less than 30 passengers total. First Class was served a mediocre breakfast, but as you know, I love plane food, so of course I cleaned my plate (washed down with a mimosa of course). 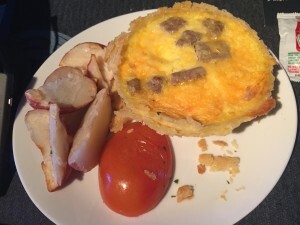 Sausage quiche and potatoes on Alaska Airlines SEA-ANC. 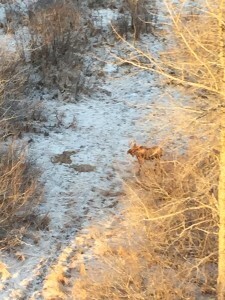 December 2014. The three hour flight flew by (I went there). Before we knew it, the sun was rising over the peaks of the nearby mountains in the Kenai Fjords National Park. It was absolutely stunning. After arriving at Ted Stevens Anchorage International Airport, we picked up the rental car and headed towards downtown. I’m not going to lie, I’m not a huge fan of driving to begin with. Furthermore, I don’t like to drive in snow/ice. So, driving from the airport to the downtown core was not the highlight of the trip for me. Downtown Anchorage left a lot to be desired (sorry ANC!) It was pretty small (think ten city blocks), but had uh-mazing views of the Knik Arm of the Cook Inlet and the surrounding mountains. We grabbed lunch at Glacier Brewhouse, which was the highest rated restaurant in Anchorage according to Open Table. It was fine. 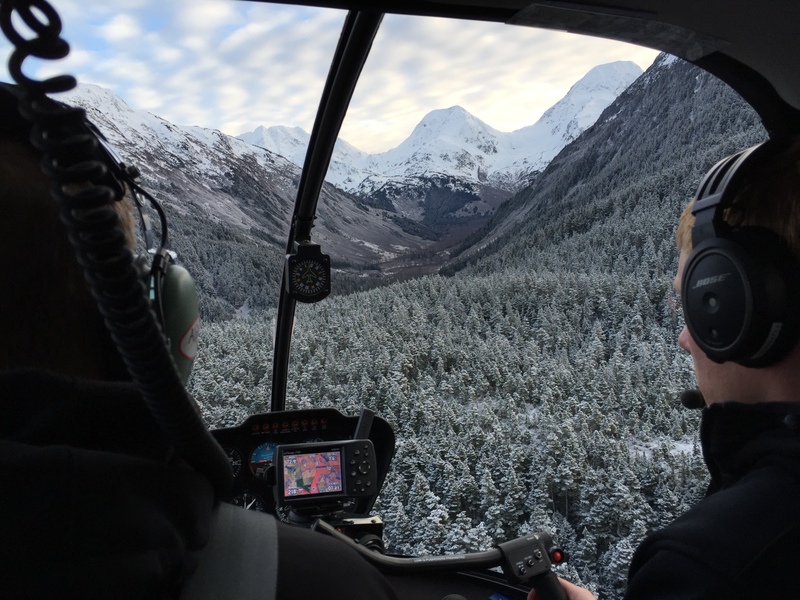 After lunch, we headed out towards Girdwood for our aerial glacier tour. Girdwood is about 40 miles from Anchorage and Google Maps anticipated the drive time would take about an hour and a half. So far things were timing out perfectly well. The route to Girdwood took us along the Turnagain Arm of the Cook Inlet on Highway 1. The road conditions were pretty good, considering it was the winter in Alaska and the thermometer on the car had yet to rise above 20 degrees. 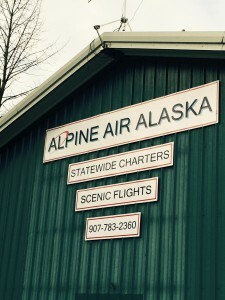 We arrived at Alpine Air Alaska’s hanger a few minutes before our appointment time. Our pilot was eagerly waiting. We quickly filled out the required paperwork, you know, the typically signing your life away should an accident happen. And then it was time. Our pilot reassured us that today was a fabulous day to be flying and mentioned that if we had been there the day before, our flight would have been cancelled due to weather. Again, we really lucked out. After a quick safety briefing, we headed out to the helicopter and boarded our bird. Before I knew it, we had liftoff. Upon takeoff, the pilot explained that there are runways maintained all over Alaska for all the planes that are needed to get people and supplies all over the state, and this particular runway was part of the network. Unfortunately a few years ago, a major storm caused the bordering river to change course and took out part of the runway. Fortunately for us, we didn’t need much runway as we just basically raised up off the ground. We turned, and headed up the valley. We had scheduled the one-hour aerial tour with glacial landing. The pilot explained that we would fly for about 20 minutes, then land for 20 minutes, then fly for 20 more minutes. 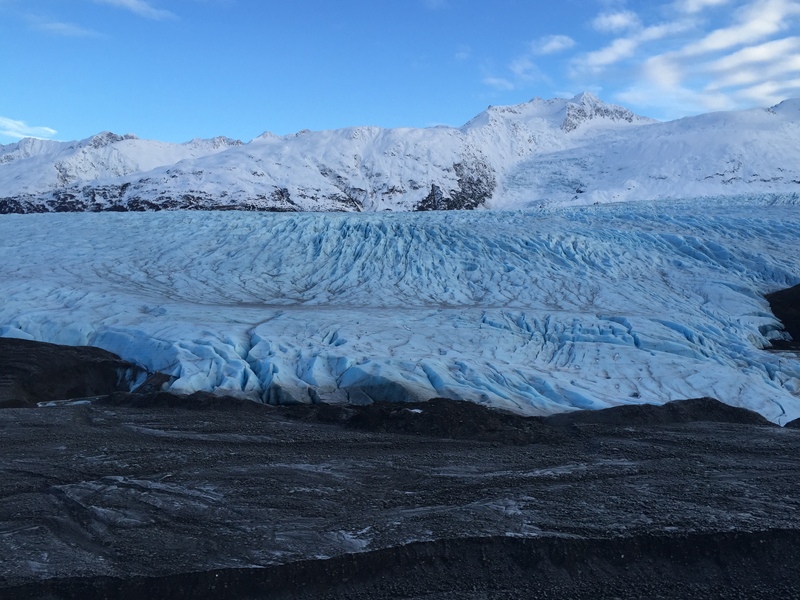 After about 20 minutes, we pulled up close to a glacier (the exact name escapes me) and touched down. Once the rotor stopped, the doors opened and there I found myself walking on a glacier. 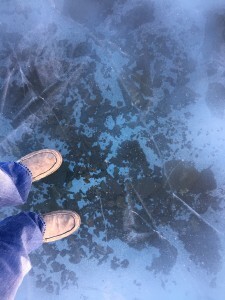 I was expecting the experience to be like walking on an ice-skating rink, but it wasn’t nearly that difficult. There were some slick patches, sure (I mean, this is one massive sheet of ice), but overall you could walk pretty normally. 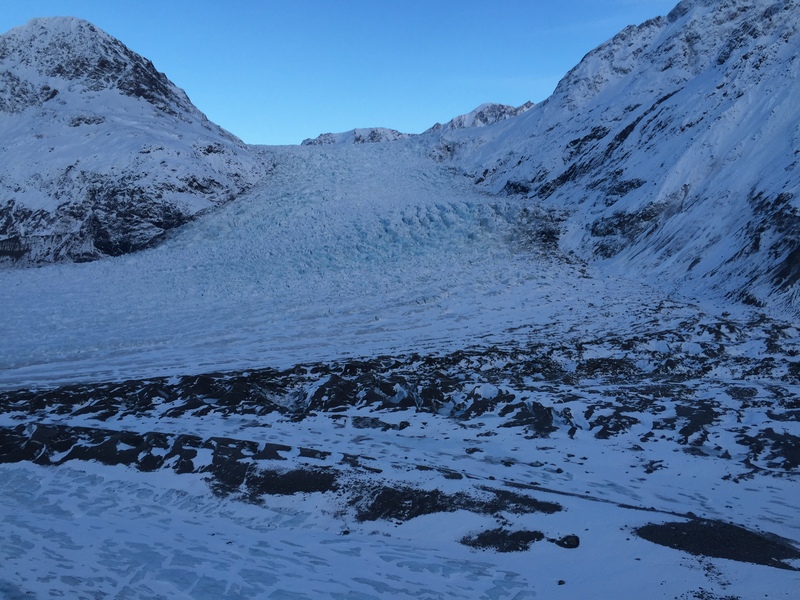 Our pilot told us of a story of a military plane that crashed higher up on the glacier in 1952 and that due to glacial movements, we may see some remnants of the wreckage. Sure enough, we came across some pieces of the plane and cargo. Kind of a surreal experience. After 20 minutes of taking photos, jumping over fissures/cracks in the ice, and general exploring, we headed back to at the helicopter to finish the tour. And then the upsell happened. 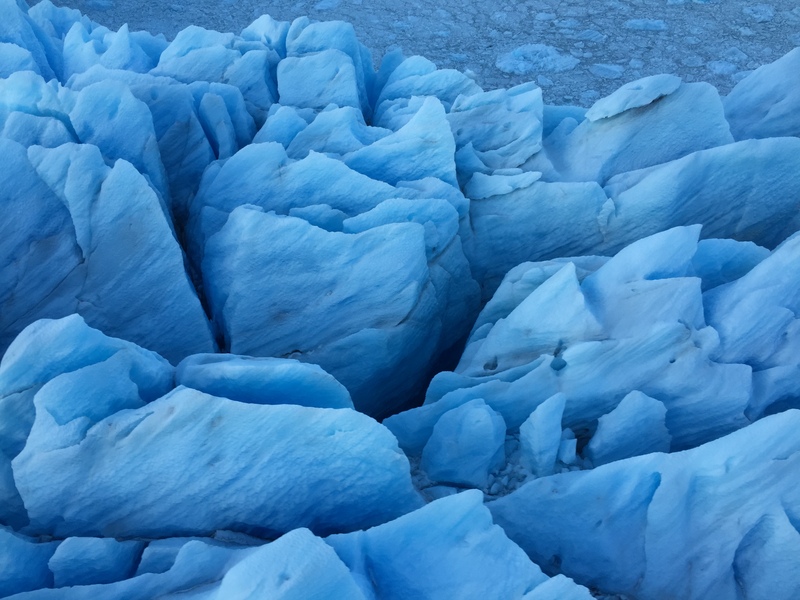 I get it – we are a captive audience and are sitting ducks on a glacier. 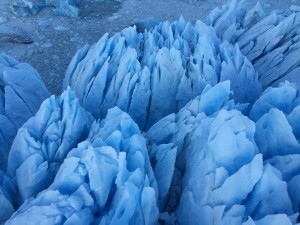 For about a hundred bucks more per person, we could extend the trip by another 30 minutes and see the seawater glaciers. What the hell, right? I don’t fault the company for an upsell, particularly since our tour was their first tour in a while (due to weather cancellations). We decided to go for it – when would we be back here? Was it worth it? Duh. As we headed back to the Alpine Air Alaska’s headquarters, our pilot was set on finding us a moose – and we did! We landed just after 3 p.m., settled our bill, and then headed back to Ted Stevens Anchorage International Airport. Along the way we saw the sun set. We got back with about an hour to kill before our flight so we hung out in the Alaska Airlines Board Room (free entry due to having an Admirals Club membership) and enjoyed a few glasses of wine. Our flight was on time and around 20 minutes before departure, we boarded. The flight was packed. Absolutely packed. Just over three hours later, we landed back in Seattle, grabbed an uber, and were back to the hotel before 11 p.m. So there you have it – how to spend seven hours in Alaska. Have you done any wacky day trips? If so, where? If not, what are you waiting for?